Scotland has one of the longest preserved histories in the world, giving it a place on the map for scary experiences, historical monuments and breathtaking encounters. Elki, a Scottish street artist based in the UK, has risen in popularity due to his collection of photo realistic hand cut stencils. During the early 2000’s, Elki’s stencils began appearing in Aberdeen’s city centre; a female police officer, a DJ and the Bag Piper. 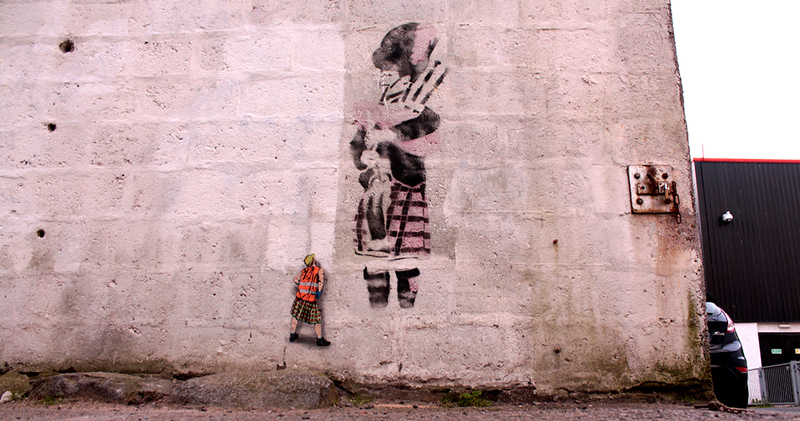 Similar to the work of Banksy, they have become recognisable feature of Aberdeen and its urban life. Motivated by inner-city life, the scenery and music were his inspirations, resulting in art reflective of Aberdeen. Located on Jopps Lane in Aberdeen, this iconic tartan-clad Bag Piper stencil is representative of Scotland and its history. In traditional dress and with the national instrument, the viewers procure a sense of the culture of Scotland and its pride. Jopps Lane is in the centre, surrounded by shops and shopping centres, where people walk through to travel further into the centre. It is a reminder that, no matter how advanced or modernised Aberdeen has become, Scotland will always remain true to their history and culture. The use of stencil is creative and identifiable. Used in nearly every institution, it gives strong, rooted edges to create an image or design. This recognisable outline is celebrated in Scotland and Elki is simply paying homage to Scotland’s roots. Therefore, seeing this new addition of Jaune’s signature workmen is a meaningful development, symbolic for the local artists scene and to street culture in Aberdeen. We can never forget Scotland’s heritage and what we had to fight for to be where we are today. Interesting to see the addition of the worker and a high-vis jacket…perhaps also a reference to the oil industry, which also permeates the city?